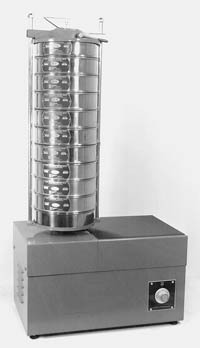 The Gilson Screen Shaker is used for gradation analysis of sample batches up to a maximum of one cubic foot (0.028 m3). 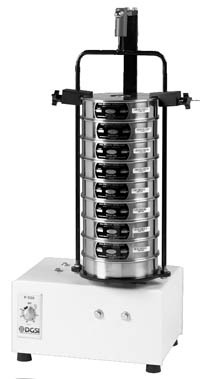 It will separate the sample into six sizes simultaneously in less than five minutes. 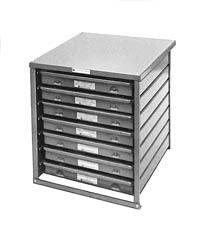 Designed primarily to separate materials with sizes in the range of 4 in (10.1 cm) to No. 4. It will also handle smaller amounts of finer materials down to No. 200. 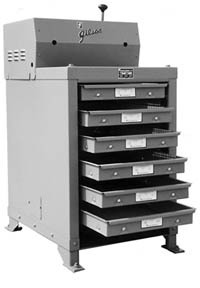 Designed to use five screen trays and a dust tray, the Shaker may be optionally fitted with six screen trays with the dust tray placed under the machine as a stationary receptacle. The opening sizes of the five standard screens, from the coarse series, should be specified at the time of order placement as they are included in the price of the Screen Shaker. Available in two models, Standard and Hydraulic. The difference is in the method of securing the trays during gradation. 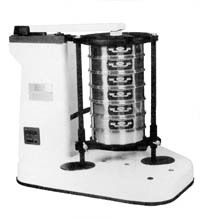 The Standard model (P-262) clamps the trays with manually operated threaded clamping rods. 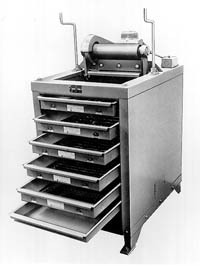 The Hydraulic model (P-261) uses two hydraulic cylinders to secure the trays and is operated with a single lever control. The screening motion of these Shakers is essentially vertical vibration set at optimum for stone and gravel materials. The Shakers are driven by a 1/2 hp, capacitor-type motor with overload protection. Trays not included.